Major U.S. indexes rose to cap off fourth straight weekly gain. Corporate earnings, positive takeaways from gross domestic product (GDP) report among drivers. S&P 500 Index +1.2%, Dow +0.9%, Nasdaq +1.3%, Russell 2000 +0.4%. All sectors finished higher. Healthcare, technology led on earnings in pharmaceuticals, semiconductors space, respectively. Breadth positive on NYSE (1.2:1), Nasdaq (1.6:1) amid slightly below-avg. volume (~97% of 30-day avg.). Treasury yields higher across the curve; 10-yr. yield +4 basis points (+0.04%) to 2.66%. Commodities: U.S. dollar weakness resumed, helping push WTI crude oil +1.0% to $66.14/bbl., COMEX gold +1.1% to $1349/oz., industrial metals mixed. Economic data: Advanced estimate of Q4 GDP came up short (+2.6% vs. +2.9%), but data showed pockets of underlying strength (consumer spending +3.8%, durable goods +2.9%, consumption +2.8%). U.S. equities opened lower amid concerns about rising interest rates, steepness of the rally. European stocks down midday. STOXX Europe 600 -0.3%, DAX -0.3%, FTSE 100 unchanged. Euro little changed vs. dollar. Asian markets closed mostly lower. Nikkei unchanged, Shanghai Composite -1.0%, Hang Seng -0.6%. Yen slightly weaker vs. dollar. Treasury yields higher; 10-yr. yield +0.05% to 2.71% ahead of Wednesday’s Federal Reserve (Fed) announcement. Commodities: Oil little changed at ~$66.12/bbl., gold -0.1% to ~$1348/oz. on dollar gains; copper +0.7% while nickel, zinc surging; potential for U.S. infrastructure boost. Economic releases: Fed’s favorite inflation measure (core PCE deflator) +1.5% year over year as expected (+1.7% headline, also as expected). Personal spending +0.4% as expected (vs. +0.6% in November). Income +0.4% (same as November) vs. 0.3% consensus. Dallas Fed Manufacturing activity for January due out later this morning. Busy earnings week on tap. With 133 S&P 500 companies having reported, fourth quarter earnings for the S&P 500 are tracking to a 13.2% year-over-year increase. Improving global growth, a weak U.S. dollar, and strong increases in energy and technology earnings are driving the strong earnings growth, which we believe is likely to be a point or two higher once all results are in. A solid 80% and 82% of S&P 500 companies have exceeded earnings and revenue targets, respectively. This week (January 29-February 2) 118 S&P 500 companies will report. Mixed messages for the dollar. The dollar was in the news last week, as Treasury Secretary Mnuchin, ECB President Mario Draghi, and President Trump all made comments that were followed by volatility in the currency markets. The messages were mixed, but ultimately more short-term weakness for the dollar followed. We believe this weakness may be overdone though, and that the dollar may actually see some moderate strength in 2018 as markets get more clarity on U.S. monetary and fiscal policy. We discuss this topic in more detail in this week’s Weekly Economic Commentary, due out later today. Week ahead. 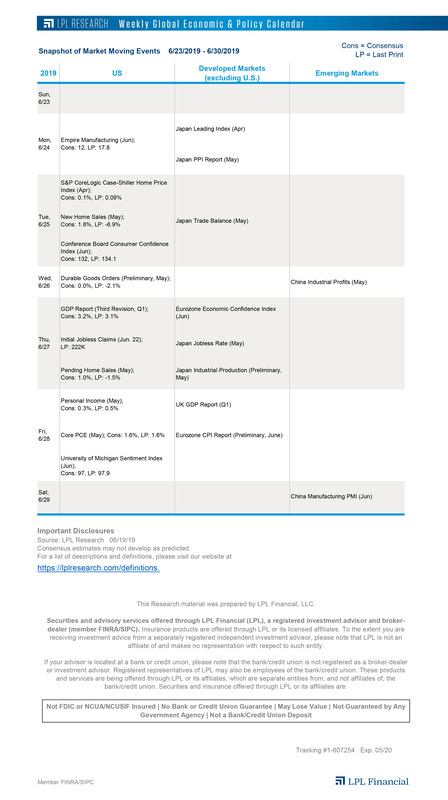 In the United States, the Fed policy meeting highlights this week’s economic calendar. No rate hike is expected, but investors will be focused on the Fed’s language to determine if rate hike path continuity will be maintained under Jerome Powell’s leadership. On the data front, look for inflation readings and the Dallas Fed Manufacturing Index on Monday; consumer confidence on Tuesday; ADP’s Employment Report, Chicago Purchasing Managers’ Index (PMI), pending home sales, and Employment Cost Index on Wednesday; ISM and Markit manufacturing on Thursday; and, the closely watched nonfarm payrolls report on Friday. Meanwhile, over 110 S&P 500 companies will report quarterly results. Turning to overseas data, in Europe reports to monitor include GDP in the Eurozone, France and Germany on Tuesday; while key data later in the week include regional inflation and manufacturing PMI, and Eurozone unemployment. China and Japan highlight the docket in Asia, with Japanese retail sales and industrial production along with PMI figures for both countries. Volatility could be coming. The recent year or so has been historically non-volatile, but we are expecting to see much more volatility in 2018–potentially quite soon. This week in our Weekly Market Commentary, we take a look at how rare the recent equity action has been, list reasons why potential volatility could be looming, and what we can do when we see an inevitable pullback. Beware midterm years. Historically, midterm years tend to see quite a bit of volatility. In fact, since 1950, out of the four-year presidential cycle, midterm years see the largest average intra-year pullback for the S&P 500. Today on the LPL Research blog we take a closer look.